Barcelona is set to hijack Real Madrid target from the English Premier League, according to report. Real Madrid is enduring a slow start to the season after the exit of Cristiano Ronaldo and they have been liked with top-notch forward to replace the Portuguese international. Tottenham Hotspur striker Harry Kane has been linked with a move to Santiago Bernabeu and Barcelona has also emerged as a shock competitor for the signature of the English forward, according to reports from Mundo Deportivo via SkySports. 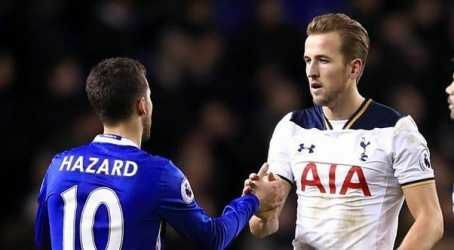 Barcelona is seeking a long-term replacement for Luis Suarez and has looked towards the direction of Kane,the Catalan based team is equally ready to knock off Real Madrid from the race. Kane has been exceptional over the last few seasons and had a good outing with England at the World Cup having won the golden boot in the tournament in Russia. It is also reported that Kane's astronomical price tag of £175 million could prove detrimental to Barcelona's plans but Real Madrid might meet up the valuation in order to shapen up their squad. Barcelona is considering other options as the likes of RB Leipzig's Timo Werner and Ajax's Kasper Dolberg are linked with the Camp Nou outfit.